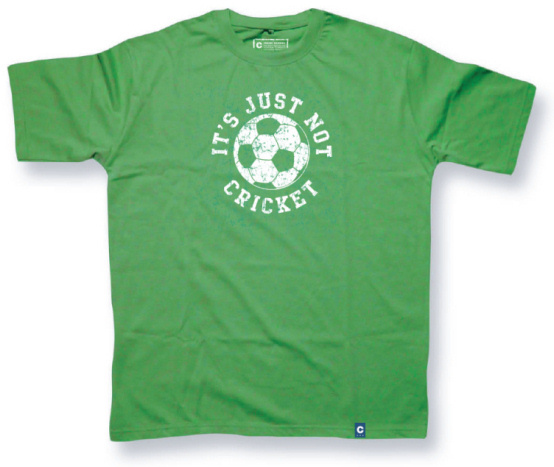 Football â€“ it’s just not cricket and thank God for that. Even the powers that be claim that the Cricket World Cup has gone on way too long. If cricket was a half-decent game in the first place, like football for example, this wouldn’t happen. This t-shirt, brought to you by Crease Clothing, makes the statement that football is not cricket, as if footy is a bad thing. We all know that’s rubbish. Cricket dreams it could be football – what sport do cricketers play when they’re messing about in training? Exactly. Anyhoo, register your support for the beautiful game by buying this tee and then burning it outside of Lord’s. Or you could just wear it.